I adore steak, I just absolutely love it & usually have it with homemade fries & peppercorn sauce but fancied a change. Try this creamy sweet potato mash for a different take if you’re tired of sweet potato fries and looking for something new. A lovely little easy & very quick dinner. 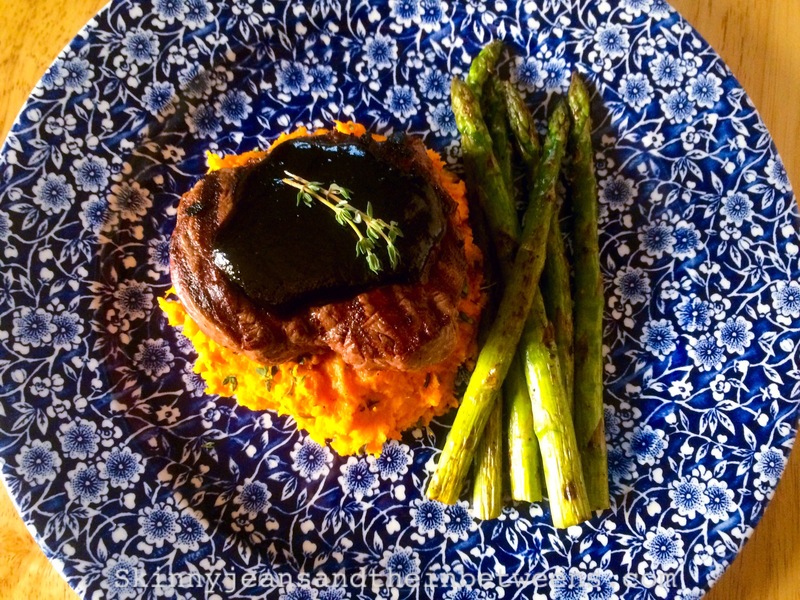 The juicy steak & balsamic reduction is so flavoursome & asparagus & balsamic is a match made in heaven! Just 11 propoints or free on the filling & healthy plan. Take your Steak out of the fridge at least an hour before cooking & allow to come to room temperature. Meanwhile peel & chop the sweet potato. Steam the sweet potato for approximately 12 minutes until soft (alternatively place in boiling water until soft) mash the sweet potato with the lightest Philadelphia cream cheese, season with salt and pepper and sprinkle on some fresh thyme. Place a griddle pan over a high heat until hot & spray with oil. Rub black pepper into the steak, season the asparagus with salt and pepper & place the steak on the pan with the seasoned asparagus spears for approximately 2 to 3 minutes each side if you like your steak very rare like me, cook for a few minutes longer each side for medium rare (4 per side) medium (6 minutes each side). Remove the steak from the heat onto a plate, cover with tinfoil & allow to rest for at least 5 minutes (this ensures the meat relaxes & becomes tender & the juice goes back into the meat making it soft & juicy). Remove the asparagus once brown griddle marks appear & the asparagus has softened slightly & keep warm if not serving immediately. 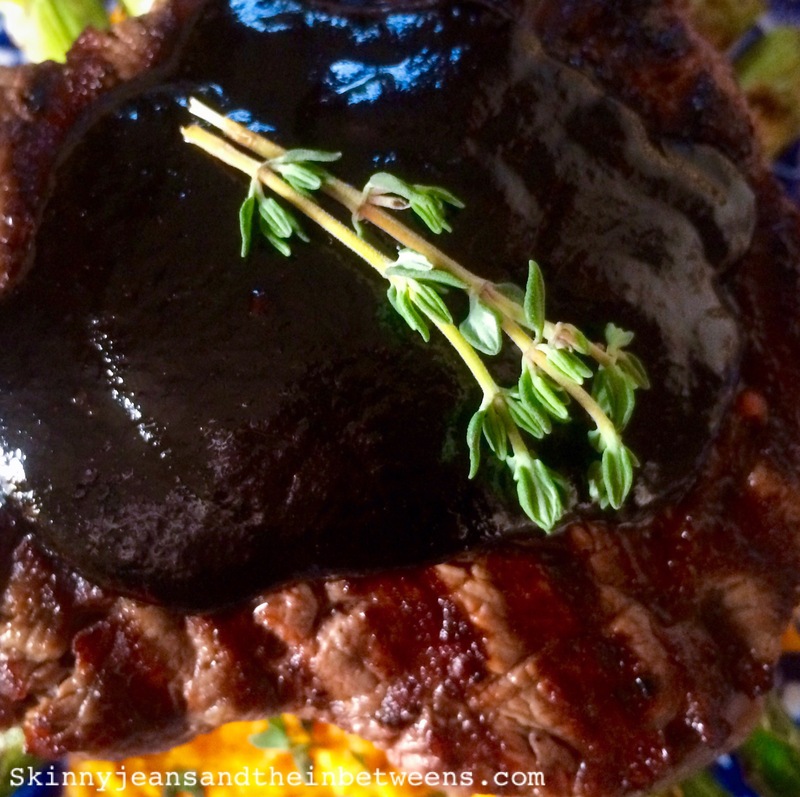 To make the balsamic & dijon reduction simmer the balsamic in a saucepan over a low to medium heat for approximately 12 to 15 minutes, stirring regularly until thickened (their will be a strong smell of vinegar at first but this burns off eventually you may need to open a window! But it’s worth it) add the remaining sauce ingredients & simmer for 5 minutes over a low heat stirring & making sure it doesn’t stick. 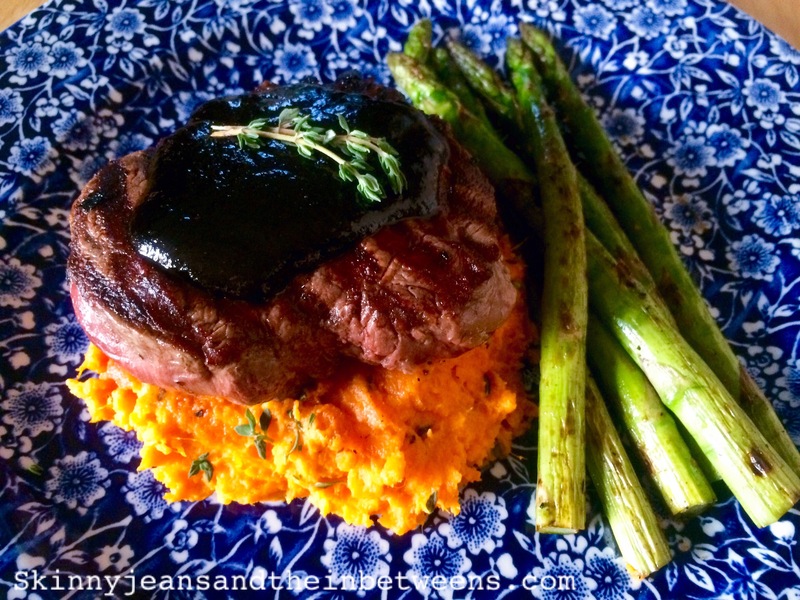 Serve the reduction immediately over your steak with the sweet potato & asparagus spears. Enjoy! « Your Bloating Survival Guide 101 – Handy Tips & Tricks to Beat the Bloat.